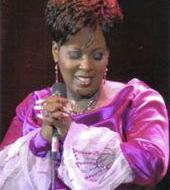 WELCOME TO THE OFFICIAL SITE OF LADY TRAMAINE HAWKINS! Thanks for stopping by our site. We have created an online community for our ministry friends to keep up with what's going on at Lady Tramaine Hawkins Ministries, as well as a place for you to hear directly from me on a variety of subjects that include my favorite topic -- worship. Please visit our new site often, as we promise to bring you fresh information on a regular basis. If you have questions or comments, require information on booking, concerts, speaking engagements, or music workshops, feel free to contact us. The 2008 Stellar Awards will be presented on Saturday, January 12, 2008 at The Grand Ole Opry House in Nashville, TN hosted by Byron Cage, Kirk Franklin, and CeCe Winans! The James Cleveland Lifetime Achievement Award! She is known throughout the gospel realm as the consummate diva. Her voice is a soaring soprano that virtually laid the foundation for others like Yolanda Adams, CeCe Winans, Kim Burrell and Mary Mary. Even the great Vanessa Bell Armstrong once told a crowd of fans that she would sing her few songs then clear the stage, "'Cause 'Maine is in the house!" CEO, Tommie E. Richardson Jr.
Business Consultant of Production, Products & Workshops.